Whether you're a country-dweller or urban homesteader, if you've got a penchant for self-sufficiency, then SPROUTING is for you! Growing sprouts at home is one of the fastest and easiest ways to grow your own food all year long. Did you know sprouts--fragile though they seem--are actually powerhouses of nutrition? I won't get into the biology, but there's an amazing process that takes place when seeds sprout. Through germination and sprouting, a transformation takes place. The seed goes from being something dormant to something living, and suddenly all the nutrients that were once locked up inside the seed become vitally available to the person who eats it. Sprouts rival citrus fruit in Vitamin C, are rich in an array of other vitamins and minerals, extremely high in protein, low in calories, and simply delicious to eat. Take broccoli sprouts, for example. Broccoli is considered a super-food with tons of cancer-fighting properties, right? Well, the level of those compounds in broccoli sprouts is--get this--one hundred times higher than what you get in broccoli heads. 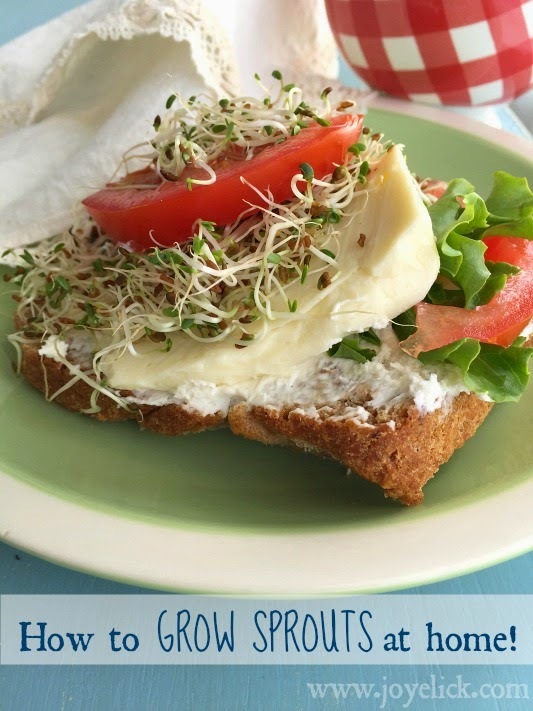 It's like sprouts have super concentrated levels of the nutrients you'd normally get by eating the mature plant. Amazing. 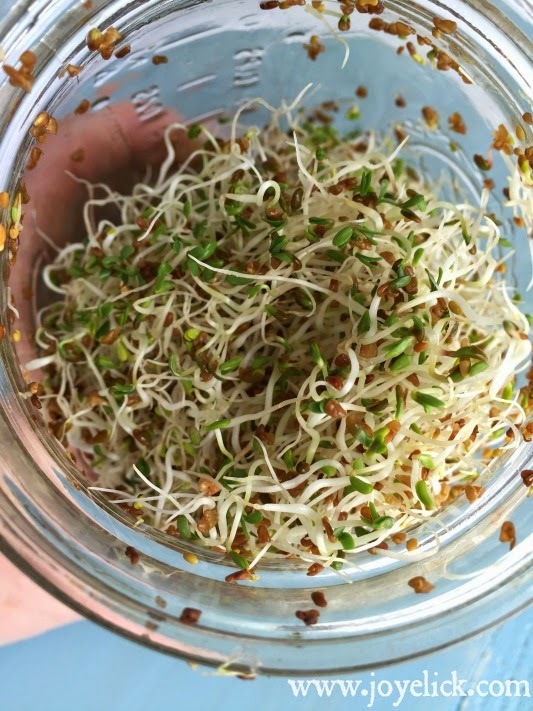 But maybe the best reason to grow sprouts at home is this: It's easy, cheap, and a way to grow the richest of plant food year-round, right on your kitchen counter. Types of seeds commonly sprouted include, grasses, vegetables, nuts, seeds, beans, and legumes. 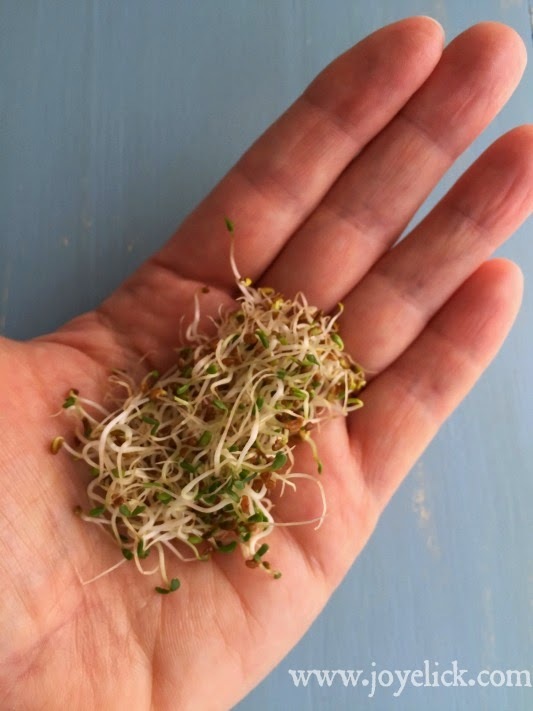 Of these, the most common to be eaten as sprouts include alfalfa and wheat grass, broccoli and other vegetables, wheat and other grains, mung and other beans, peas and lentils, sunflower and other seeds, almonds and other nuts. Sprouts come in a wide range of flavors and textures. They're commonly eaten in salads or stir-fries, but can also be added to breads, pancakes, muffins, etc. Also, some sprouts, such as beans and lentils should be cooked before being eaten, as they can contain anti-nutrients that are hard to digest. These are often cooked in stir-fry recipes, or cooked and served in salad. Sprouts offer many health benefits, but there have been occasional instances where commercially grown sprouts have been found to be contaminated with E. coli and Salmonella bacteria. The moist, warm conditions required for growing sprouts can also increase the possibility of harmful bacteria. To have the most successful experience growing safe and healthy sprouts, be sure to use only clean tools. It's also very important to purchase the right kind of seeds. When selecting seeds to sprout, look for ones that have been prepared specifically for sprouting by a certified pathogen-free source. Sometimes, seeds grown in fields can become contaminated by fertilizers and such, and it may be these pathogens that can cause the harmful bacteria in sprouts as mentioned above. Also, another important distinction when selecting sprouting seeds is that they should be seed-grade seeds, as these are meant to germinate. Most food-grade seeds are meant to be cooked, and are usually sterile. You can find sprouting seeds in your local health food store, or on-line. *NOTE: If you want to grow a variety of sprouts and don't want to do it in jars, another great option is a sprouting tower with stacking trays (like this). 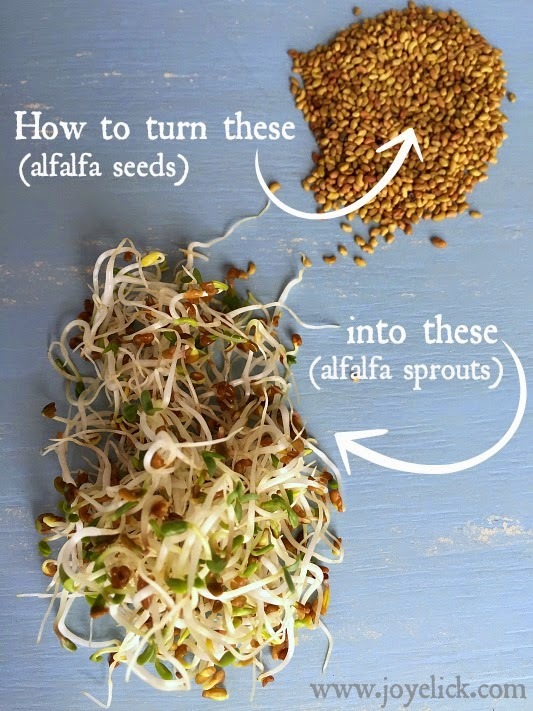 The tutorial below shows you how to grow alfalfa sprouts. Other types of sprouts will vary in the number of days to rinse and soak, etc. 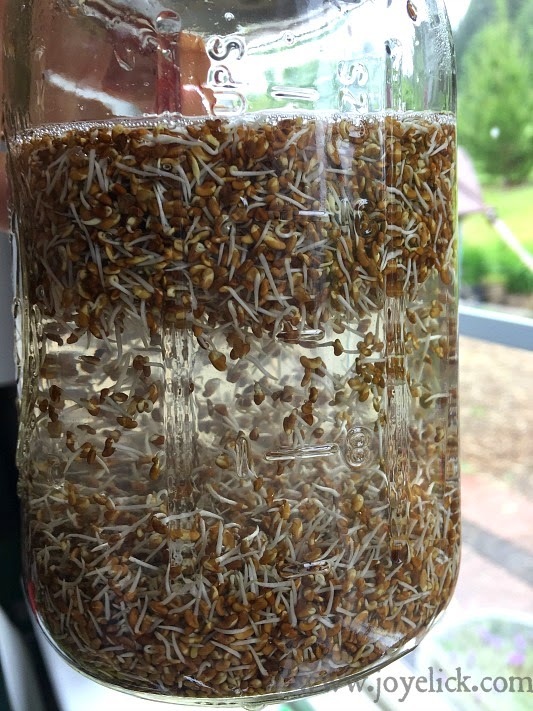 (Here's a link to a good chart for soaking and sprouting different kinds of seeds). Thoroughly rinse seeds. Just for good measure, you should wash your hands before handling the seeds you plan to sprout. 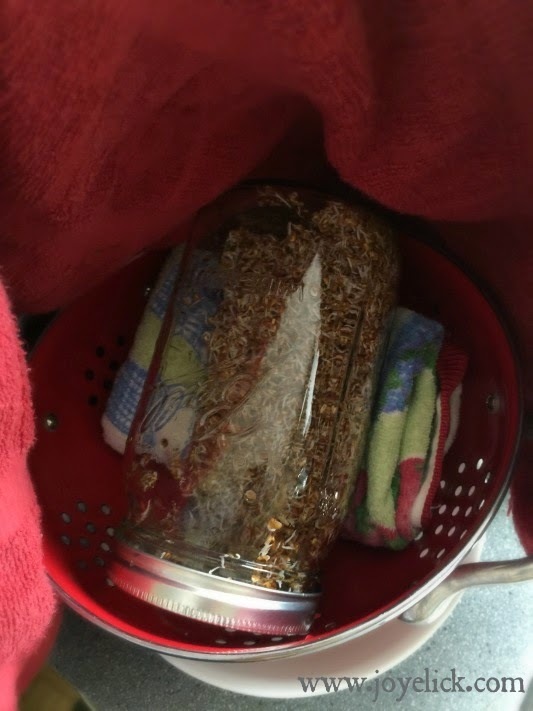 Place the seeds in a large wire mesh sieve and rinse with cool filtered water (we have a super-duper whole house filter system, so I just use our excellent filtered well water). 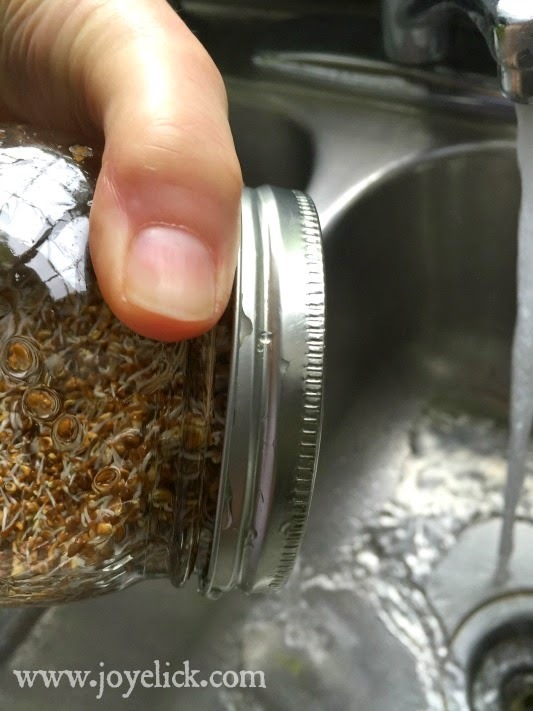 You can also, simply place the seeds directly into the sprouting jar and rinse and drain through the wire mesh sprouting lid. Just be sure to rinse well to remove dirt, grit, debris, and any other kind of unwanted residue, such as pesticides (but if you're using organic seeds this risk should be minimal). 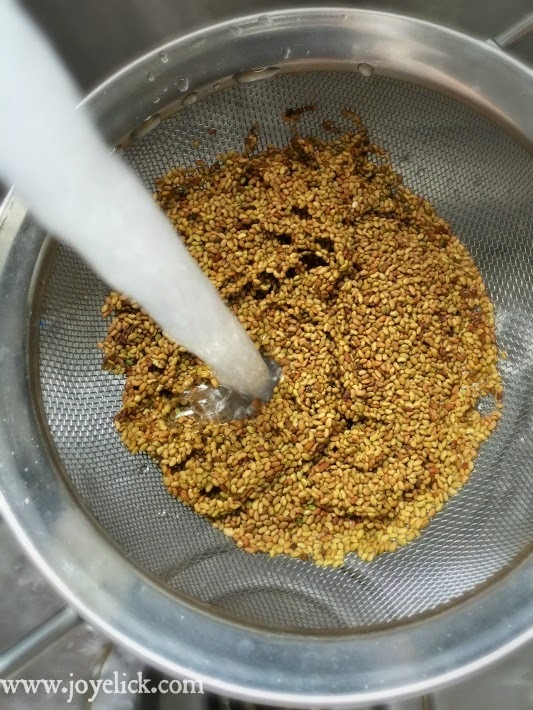 Remove sterile seeds. 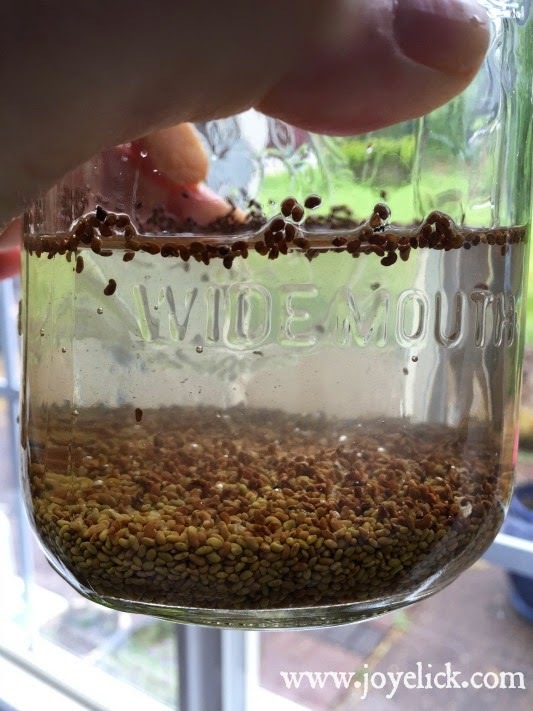 Place the rinsed seeds in the sprouting jar and cover with water to about 2 inches above the surface of the seeds. There will likely be some seeds that float on the top of the water. These are most likely sterile and should be skimmed and removed. Let seeds soak. 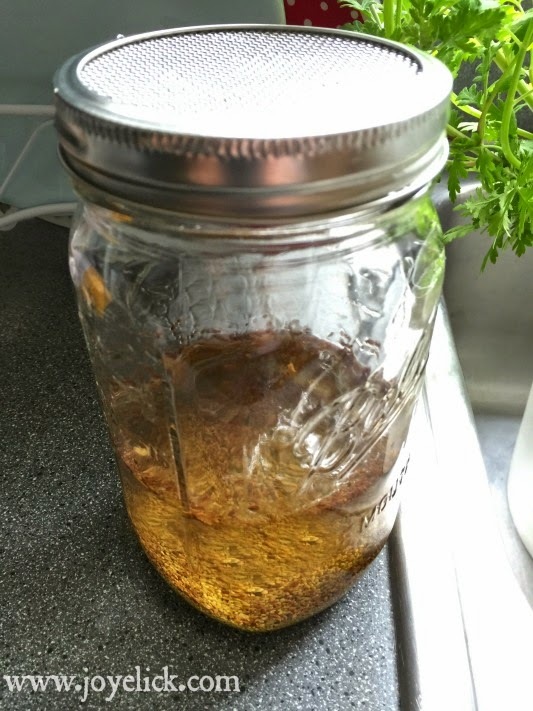 Place the sprouting jar with seeds on the counter to soak for about 6 - 12 hours. I just leave mine over night. This soaking prepares the seeds to germinate. Follow a pattern of rinse-drain-cover for the next three days. 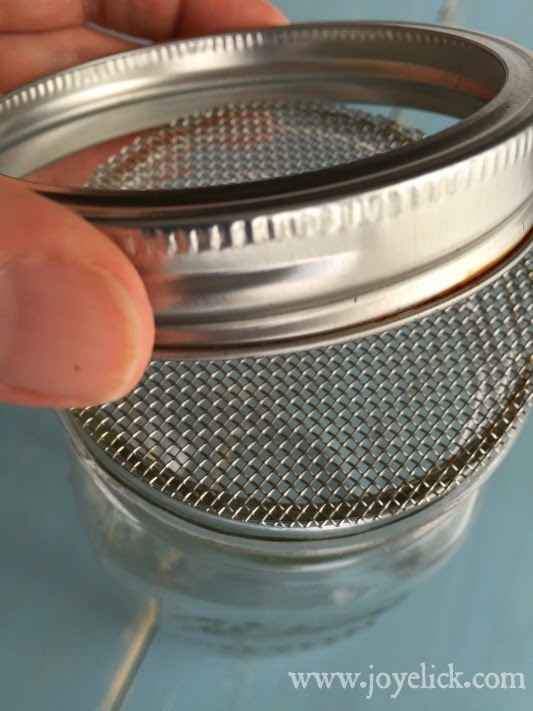 After the initial soaking period, pour the water out of the jar right through the screen of the sprouting lid. The water will look a bit yellow from the tannins being released from the seed shells. Rinse. Refill the jar and rinse a couple more times, until the water runs clear. Drain. Thoroughly drain, then place the jar at a 45-degree angle in a colander, or dish drainer, to allow any remaining water to drain out. Make sure the seeds do not entirely cover the screen, or your seeds will not get the air they need. This could cause them to sour and spoil. Cover. Place a towel over the colander and jar so the seeds can lay in darkness and have the best chance of germinating. Leave them covered until it's time to rinse and drain again (about every 8 - 12 hours, or 2 -3 times a day). Let the light shine. Once your sprouts have reached the length you want (alfalfa is typically about 1 inch), it's time to expose them to the light so they can green up. They should each have two little yellow leaves at this point. What you want is a nice deep green. Continue with the rinsing and draining pattern, but leave the jar of sprouts uncovered in direct sunlight until their leaves green up. This may take up to three more days, but it could happen faster. Now that the sprouts are filling the jar, it's even more important to make sure they don't entirely cover the screen. They need air to avoid spoiling. Harvest. When the sprouts are green, they're ready to harvest. It's a good idea to rinse and cull sprouts before storing them, as this will help them last longer. Remove the sprouts from the jar and place them in a clean bowl of fresh water. With clean hands, pull the mass of spouts apart gently and stir them slightly. Any loose hulls or un-sprouted seeds should float to the surface of the water where they can be skimmed off. When done, place the sprouts in a wire mesh sieve. Give them one last rinse and drain thoroughly. Store sprouts. 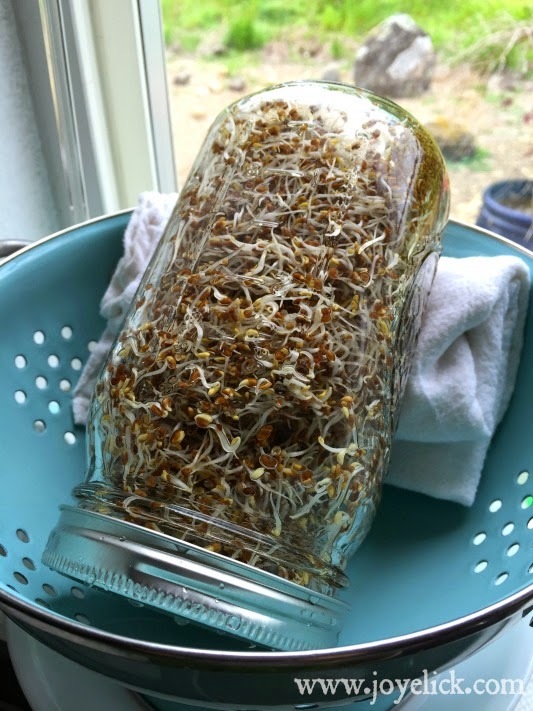 To store, place the drained sprouts in a container lined with a paper towel to absorb any excess moisture. The container should be twice the volume of the amount of sprouts being stored to avoid over-crowding. Cover and store in the fridge. Use within one week. What other food do you grow on your kitchen counter? I'd love to hear your story!